The Port of Coupeville is a Washington State municipal corporation governed by an elected commission, responsible to their district electorate for economic development and management of its facilities. The Port District extends from north of Coupeville, to Greenbank, an area which includes Ebey’s Landing National Historical Reserve and the Navy Outlying Field. The Port of Coupeville is concerned that significant expansion of EA-18G Growler operations at OLF will have negative impacts to the district, including diminishment of tourism, devaluation of local real estate (which impacts tax revenues for municipalities), and risks to residents from jet noise and fuel emissions. The Port now appreciates the opportunity to review and provide feedback on the adverse effects of the proposed expansion to historic structures. 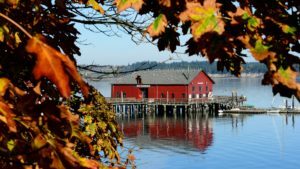 Coupeville, the second oldest town in Washington State, has a long record of preserving its historical and rural character. Many of our constituents choose to reside here because they value these qualities. The Port owns two heritage properties–the 1905 Coupeville Wharf and 1904 Greenbank Farm. Both are regional landmarks that generate significant direct and indirect income to Island County. It undermines the cultural and historical importance of the structure and its setting. Increased noise levels will reduce the number of visitors to the Wharf who utilize it for education, recreation, shopping, eating, and as a community gathering space. With reduced traffic, it creates potential loss of income for business owners at the Wharf and downtown; as well as sales tax revenues for Island County. It harms the structure’s future value and integrity for the public as a historic and cultural landmark. Any reduction or lessening of the increase in local property values over time would financially impact the Port’s ability to make infrastructure improvements to its historic properties. Elect/implement a plan for increased flight operations well below the proposed four-fold increase. Limit flight operations to times of least impact to Coupeville’s residents, businesses and critical tourism traffic, including weekends and evening hours. Take steps to contain flight traffic away from the Coupeville downtown area. Employ sound insulating and barrier technologies to minimize the effects of jet noise to surrounding communities. Work in partnership with the Trust Board of Ebey’s Landing National Historical Reserve and other stakeholders to find mutually acceptable resolutions that minimize adverse effects to all historic structures contained within the Reserve. The Port is a strong supporter of our nation’s Armed Forces, especially the Navy and its operation on Whidbey Island. We recognize the vital contributions of service members to our Island County economy, work force, schools and community organizations and we are grateful for their service to our country. We are also grateful for the opportunity to share our views and comments on matters of vital importance to the present and future welfare of our Port district constituents.